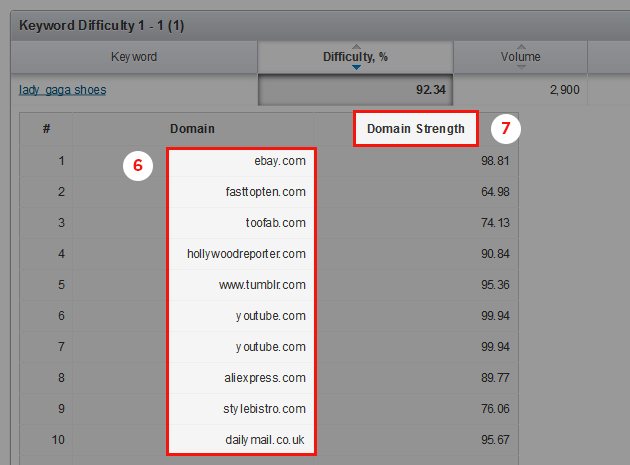 SEMrush Keyword Difficulty Tool is Live! We are happy to announce the launch of the Keyword Difficulty Tool. It is designed to estimate how difficult it would be to seize your competitors’ positions in organic search within the Google or Bing top 20 with a particular keyword. What do we take into consideration to calculate keyword difficulty? We take the list of domains that are ranking in Google or Bing top 20 organic search results for the given keyword. Based on each website’s SEMrush Rank, we calculate their domain strength, and define the average number range, from 1 to 100%. The higher the percentage, the more effort you’ll need to outrank your competition for targeted keywords. How is the Keyword Difficulty Tool useful for you? Imagine we want to get a higher ranking for a new online shoes shop. First, let’s start with discovering keywords with a lower keyword difficulty. It could give us more chances to overrun our competition. 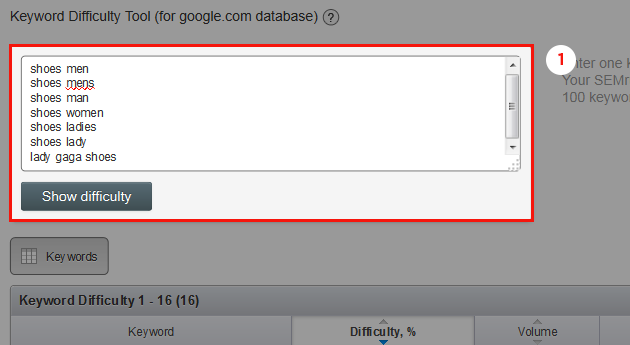 Type one or more keywords into the Keyword Difficulty box (1). Enter one keyword per line. Then click the Show Difficulty button. For every requested keyword, you will also see its Difficulty (2), Volume, Results, Trend, and SERP source. By default, all keywords are sorted in descending order by difficulty. Look, the most difficult term is lady gaga shoes with 92.34%. 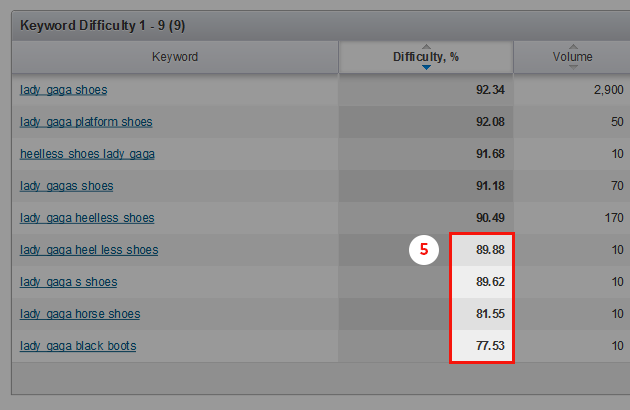 But the keyword difficulty of shoes lady is 79.45% (3). Not so high! 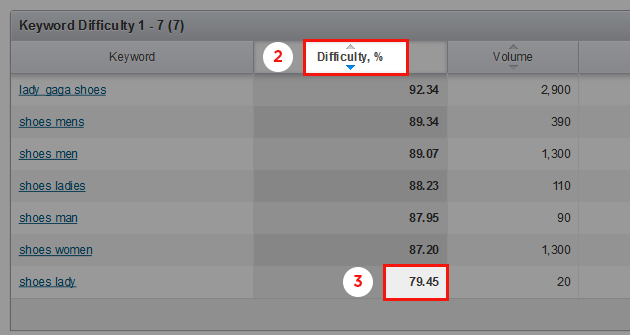 By analyzing related search terms, we see that their keyword difficulty could be even lower (4). So with them, getting to the top of the SERPs will be a bit easier. But what if your target audience prefers extraordinary shoes, and the only way to enter the top search results is by using “lady gaga shoes,” whose difficulty is more than 90%? As a new arrival on the market, do you have any chance to overrun your competition? We believe you do! Check similar keywords and you’ll see that search terms for unusual footwear can have keyword difficulty below 90-80% (5). So don’t fear entering the online struggle with big players! 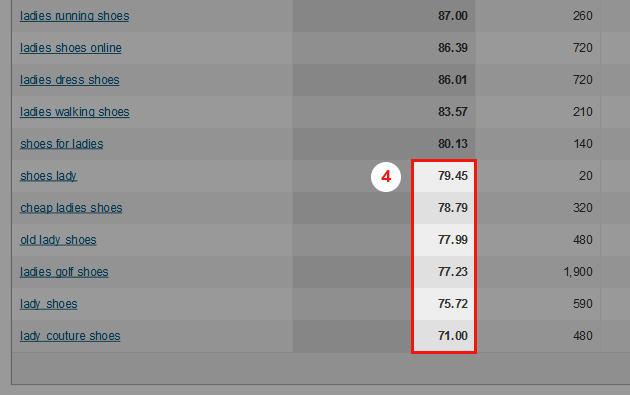 To display which websites (6) you’ll have to compete with, click the number within the Difficulty column. You’ll also see their domain strength (7). The report’s data is exportable to XLS and CSV. At this time, Pro, Guru, and Enterprise customers can compare the difficulty of up to 100 keywords. Use the SEMrush Keyword Difficulty Tool, and instantly define keywords that give your website more chances to overrun the competition! New design of the SEMrush Reports: more beautiful data visualizations!